Puerto Morelos belongs to the second largest reef barrier in the world. This place is only 20 minutes away from Cancun International Airport, and swimming with dolphins there is something to remember, as it is also full of history and magic. Discover this mangrove place and dare to visit it on your next vacation. The territory on which this community is based is very peculiar. They have mangroves that communicate with the sea, which helps the renewal and reproduction of birds, marine species, flora and fauna. The second largest reef in the world is located within a few meters from the coast and constitutes a protection barrier for the community, that allows to have cleaner beaches by reducing the high tides and the strong waves. All this has turned Puerto Morelos into a National Park. The place where today lies Puerto Morelos’ community was rightly chosen since it’s a space with sufficient depth and breadth between the heads of the coral reef, which would allow the passage of deep and wide boats. The strategic design of this settlement provoked, by the nature of the soil and the land, a territorial expansion and an increase on the activities that sustain the port economically. The ecosystems found at "Arrecife de Puerto Morelos" National Park are the most important source of income, since the main activities of the settlers are fishing and tourism. What began as a warehouse to enable the exportation of gum from the gum tree and the wood of the dye tree, is now the oldest ‘portian’ community in the Mexican Caribbean. Just 35 km. away from Cancun, Puerto Morelos has a population of approximately 33 thousand inhabitants. This town has attributes that make it worthy of maintaining its identity in order to preserve its essence as a tourist destination, as a port, as a starting point from Riviera Maya and above all, as a natural, quiet and clean place. It has a wide gastronomic offer. Puerto Morelos is for adventurers who seek to experience that side of the Mexican Caribbean somewhat apart from conventional tourism. 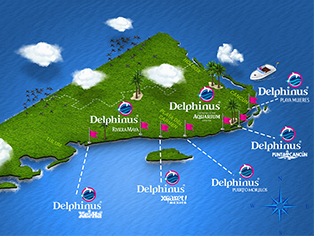 At Delphinus we offer you equally exceptional experiences, plan your swim with dolphins in this spot of Cancun and enjoy its history and marine architecture.